6/29/12 FYSF Cloth Wipes, Pouch and Baby Bum Drops! Today we're not going to Feed Your Cloth Diaper Stash, we're going to Feed Your Cloth Wipes Stash! Enter this week's Feed Your Stash Friday Giveaway and you could win cloth wipes, a Planetwise wipes pouch and Baby Bum Drops cloth wipe solution. We're announcing the winner of last weeks Feed Your Stash Friday Giveaway! We gave you all a chance to win a Blueberry Pail Liner and Rockin' Green Soap and you all proved you wanted to win! So who did win? Read today's post and find out! Free Onesize Pocket Diaper on orders over $49! Free Pocket Diaper when you order $49 or more at DiaperJunction.com! That's right! These deals don't come around that often and they can end without warning, so you've got to act fast. Some restrictions do apply. Please read entire blog post for details. Cloth Wipes, They're easier than you think! I knew from the start of cloth diapering I would use cloth wipes. It just makes sense. I'm already washing the diapers, why not the wipes too? So how do you use cloth wipes? Are they inconvenient? Actually, I think they're easier than you think! When I think of modern cloth diapers, BumGenius is instantly a brand that comes to mind! I love this company and all that they stand for! Its easy to fall in love with a company that stands behind its products and works within the community to help others. BumGenius diapers were among the first diapers in my stash and I still love them 10 months later! 6/22/12 FYSF Diaper Pail Liner and Rockin' Green Soap! We've got a new FYSF Giveaway for you! This week you can enter to win some great cloth diaper accessories and staple items. A Blueberry Pail Liner & bag of Rockin' Green Cloth Diaper Laundry Detergent. 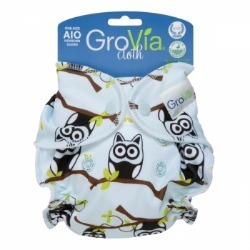 Two items that every cloth diapering family is sure to be able to use! Winner of our Feed Your Stash Friday cloth diaper giveaway has been chosen! This week's winner receives a Duo of Thirsties Duo Diapers! Were you the lucky winner? Better check and see! Cloth Diapering, What does it take to be prepared? Choosing cloth diapers? Trying to make sure you're prepared? Read this blog post from one cloth diaper mom about how she prepared herself for cloth diapers and then began to wonder "can you ever really be prepared?" Many cloth diapers require special cloth diaper detergent that will do them no harm but still get your diapers clean and must be safe for baby's sensitive skin. One of the most popular cloth laundry detergents on the market is the Rockin Green detergent. Today's FYSF is Thirsties themed! Here at Diaper Junction we love Thirsties Cloth Diapers and this week we're giving you a chance to win TWO of their popular Thirsties Duo Diapers! FYSF Winner, Flip Travel Pack, is Karrie K! Winners announcement for last week's Feed Your Stash Friday Giveaway! We gave you all a chance to win a Flip Build Your Own Travel Pack and a winner has been chosen. Is it you? VOTE and ENTER the Planetwise Sweeps! Planetwise is having a HUGE Sweepstakes on their Facebook Page and we want you to enter! Not only are there a lot of chances for YOU to win, but WE can win too! Vote for Diaper Junction as your favorite Planetwise retailer! It takes a whole village! Once you give sensible moms and dads out there the new option to cloth diaper, many of them jump on board because they just hadnt realized that they could save so much money! And when this happens, one solitary cloth diapering family suddenly becomes a part of something bigger than themselves, they become a community. The world of reusable cloth diapers has definitely come a long way. In the past, the market for cloth diapers was lacking extensively in major areas, such as swim diapers. Now, you can even find a great reusable swim diaper that is a much better idea than disposable swim diapers for the summer. One of the most exciting new cloth diaper brands for parents that is on the market today is FuzziBunz. There are so many things that make FuzziBunz diapers some of the best cloth diapers on the market today. It is no wonder that parents and babies alike love this brand.